MONTROSS: Descendants of a plantation slave family thanked God and history yesterday for who they are and their complicated legacy, which includes the manor house that was the birthplace of Confederate General Robert E. Lee. "When you say Lee, I can stick my chest out," said Elwood Payne, who flew from El Paso, Texas, to join more than 300 aunts, uncles and cousins celebrating a family reunion at Stratford Hall. The get-together at the Colonial architectural masterpiece was the Payne family's first, and in true Virginia fashion it underscored the mix of pride and pain that infuses any past worth having. Family members hugged and laughed and spoke reverently of William Wesley Payne, the son of slaves whom they still call "Uncle Wes" without any sense of betrayal. "It's hard to describe the feelings you get here," continued Elwood Payne. He is the grandson of Uncle Wes and great-great-grandson of William Payne, who was born into slavery at Stratford Hall as Lee property and is known to fami- ly members as "Uncle Bill." For as long as anyone can tell, the Payne family worked on the sprawling Westmoreland County plantation, first as slaves then as gardeners, cooks and handymen for the Robert E. Lee Memorial Association that operates the 1,700-acre estate as a historic shrine. The family's history "has been tough to swallow at times," admitted 44-year-old Ernest Wilson. As a youngster, he played in the deep woods that cloak Stratford's hills, but now is raising a family of his own in the rootless suburbs of Northern Virginia. He wants his sons to connect with the power of place that he now realizes he felt as a child. He wants them to connect with the dignity of his family's past. He wants them to recognize that his ancestors' suffering and sacrifice made his family what it is today. "I didn't like my grandmother working in the kitchen and people calling her Laura instead of Mrs. Streets," Wilson recalled. "But, I realize now, they worked hard so we could make it. It kind of humbles me." Stratford Hall was built in the 1730s by Thomas Lee, a man of substance who was president of the Virginia Council. Lee wasted no time establishing the brooding edifice as the cradle for an early American dynasty. Two of his sons, Richard Henry Lee and Francis Lightfoot Lee, became the only two brothers to sign the Declaration of Independence. Another member of the Stratford Lee line was Robert E. Lee, the Confederate general who is regarded as one of the greatest military strategists the county has spawned. Payne family members said they saw their own heritage reflected in the mansion's brick walls. But, they found their touchstone a short walk down a leaf-littered gravel path from the Great House. There, beside a sun-lighted glade, stands a one-room log cabin. Uncle Wes's cabin. The memorial association built the cabin in 1941 on the site of his birth to honor "Uncle Wes." Lois Johnson, a family member who lives in Westmoreland County near Stratford and spent four years researching and organizing to make the reunion possible, said the Paynes were indispensable to the success of the plantation and the Lee family name. "The Lees would not have been what they were if it had not been for the Paynes," she said. 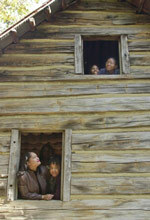 The foundation has never disputed the claim and has included Payne family photos and memorabilia in its visitor center exhibits about the Stratford Lees. "They had so much respect for Uncle Wes," Johnson said of the foundation directors who built the cabin. "He was a part of Stratford." Yesterday's get-together was "the first time we have met here as a family since the time of Thomas Lee," Johnson said. But, 17-year-old Whitney Henry, of Annapolis, Md., felt a fleeting tingle when she clambered up a ladder into the cabin loft and looked out a window across the splendid fall woods. "It felt," she said, "like I had been there before."